Grasshopper, which is gaining immerse popularity within certain design disciplines, is a generative design and modeling plugin for Rhinoceros 3D. It can also be used to add parametric control to Rhino 3D models. As of this writing, it can be downloaded freely from http://www.rhino3d.com/download/grasshopper/1.0/wip. 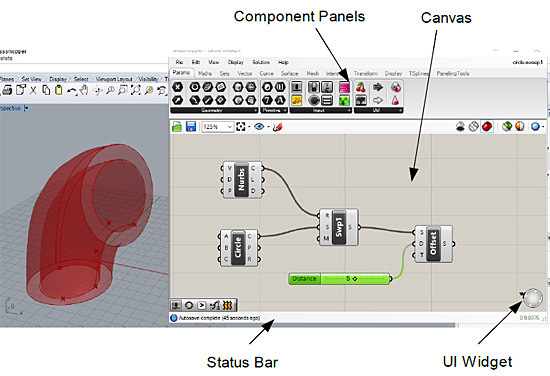 Studiorola offers Basic Grasshopper for Rhino 3D Training (In Singapore). 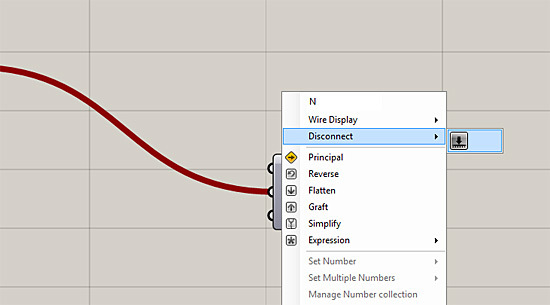 This tutorial explores the software interface of Grasshopper. To be able to follow this tutorial well, the Reader will need to have a basic proficiency of Rhinoceros, the popular, user-friendly and amazing NURBS 3D modelling program. The interface layout and its elements are as shown below. 1. At Rhino command prompt, execute Grasshopper command. This will open up the Grasshopper window. 3. 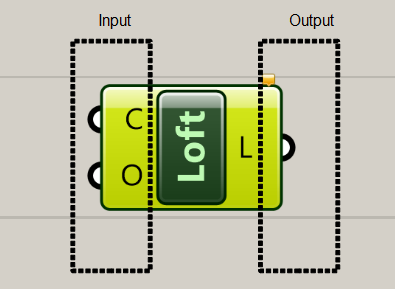 Drag connectors from output sockets to input sockets to establish the connections. The left side sockets are for receiving inputs; whereas the right side sockets are for downstreaming outputs. Method 2: Double click on the canvas to bring up the keyword search box. To disconnect from a socket, right-mouse click, select Disconnect. To copy Node, drag the component and press the Alt key. save a definition in Grasshopper, go to File > Save or File Save As commands. 2. .ghx format for Grasshopper XML. .gh is the default format. editable geometry. 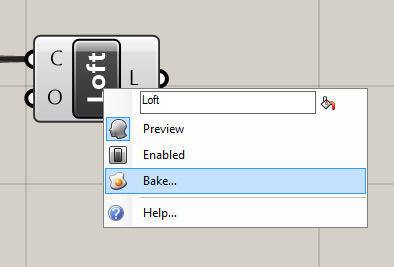 Right click and select Bake. That is all for a very simple and basic intro. Hope that it is useful for you starting on using Grasshopper.